I am haunted by THE DEPARTURE. This film is a cinematic spiritual quest, a there and back again trip to the mountain top that will leave you moved, teary eyed and utterly vibrating with the sense of feeling alive. My original idea for this review was simply to write one word PROFOUND and let everyone deduce what I meant by that. However that isn't fair to you or the film and instead I'll try to cobble some thoughts together. 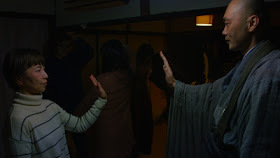 The film is a portrait of Buddhist monk,Ittesu Nemoto. A onetime partying punk, after a bad motorcycle accident he answered an ad for a monk (no experience necessary) and his vocation was born. Ittesu lives with his wife, his two year old son and his mother at a temple. He is best known for trying to help those contemplating suicide. He is so good at what he does that his phone never stops ringing and his health is in jeopardy, at 44 he’s already had one heart attack and is working on a second. To get over it he occasional rides his motorcycle into the city and dances all night in a club. Alternating moments of real life, his wife and son, with his running retreats (the title comes from a retreat on death he runs) and his counseling of the hurting the film is glorious examination of what it is to live life. Sitting watching the film I found myself quietly crying at the beauty and profound sense of enlightenment that seemed to be bleeding off the screen. Moments of depression give way to clarity. A crying baby suddenly turns to laughter. Joy and pain are found in unexpected places. But as with life the moments are fleeting and the highs and lows pass and change and become something else. Director Lana Wilson has made a film that takes us through a variety of experiences to show us the course of a life and all life. Along the way we are forced to ponder what everything is all about and why we are here. Ultimately we are asked to examine what it means to be alive and what it means to die. At times its a bumpy journey and I wanted for the film to return to the philosophy that Nemoto was explaining and then suddenly it hit me, that it is all his philosophy. Everything reflects his out look. He doesn't stop discussing the way to be, all his life is that way and it's full of wrong turns- he still parties despite health issues and he is't always going to say the right thing. I was moved by the film the result of something happening on screen forcing a moment of clarity and understanding. When the film was over I turned to Hubert Vigilla, who was sitting next to me, and we said nothing. There was nothing to say, the film had said it all, the profundity of what we had seen rattling around between us in the silence. Several years ago there was a Broadway show called Getting and Spending about a hot shot lawyer who left it all and went off to be a monk. After almost being talked out of staying with the order the lawyer returns to the monastery. The woman who was trying to get him to leave asks him why are you going back when the life was so hard and then he was never going to be enlightened. His reply was that yes it was a tough life, but its the way he chose. As for being enlightened, it was there, not all at once, not all the time, but in moments and in flashes it all comes together and one can see the moment of clarity. THE DEPARTURE is a kind of moment of clarity. It is an explanation of what it means to be alive. It is a small quiet film that is thunderous in it's effect. Its not always there, but there are flashes (actually much more than flashes) that add up to a profoundly moving experience. For those who don’t care about the philosophy the film offers a good look at the life of a modern day monk. I love this film and I can’t get it out of my head…to the extent where my schedule lined up and I realized that I could see the film a second time at Tribeca I was thrilled and added it to my film list.